Every day, America’s adversaries are testing our cyber defenses. They attempt to gain access to our critical infrastructure, exploit our great companies, and undermine our entire way of life. And we can’t let that happen. This vital legislation will establish a new agency within the Department of Homeland Security to lead the federal government’s civilian response to these cyber threats against our nation. We’ve had many, many threats against our nation. Cyber is going to be the newest form. And the threats have taken place, and we’ve been doing pretty good in knocking them out, but now we’ll be — this will make us, I think, much more effective. We’re putting people that are the best in the world, in charge. And I think we’re going to have a whole different ballgame. Cyber is, to a large extent, where it’s at nowadays. The men and women of the new Cybersecurity and Infrastructure Security Agency will be on the front lines of our cyber defense. They will partner with the private sector, and all levels of government, to defend America’s power grids, banks, telecommunications, and other critical parts of our economy. The bill known as the Cybersecurity and Infrastructure Security Agency Act swiftly passed in Congress in October; and last week, H.R. 335 advanced through the House Of Representatives without any resistance and barely any media attention. Trump signed the bill into law almost immediately after the legislation passed the House. The NPPD was first established in 2007 and has been responsible over the past few years for handling almost all of the DHS’ cybersecurity issues and other projects. As part of the DHS, the NPPD was the government entity in charge of physical and cybersecurity of federal networks and critical infrastructure. The previous agency also oversaw the Federal Protective Service (FPS), the Office of Biometric Identity Management (OBIM), the Office of Cyber and Infrastructure Analysis (OCIA), the Office of Cybersecurity & Communications (OC&C), and the Office of Infrastructure Protection (OIP). Nothing is expected to change in day-to-day operations for the agency, but being reorganized as a federal agency, CISA will now benefit from an increased budget and more authority in imposing its directives. Although, CISA will still face oversight by the DHS at the end of the day. To put that into perspective for you, CISA now has the same power as the U.S. Secret Service or FEMA. CISA will be responsible for leading cybersecurity, critical infrastructure protection programs, developing associated policy, and coordinating with federal and private sector entities on security matters. CSA will also be responsible for performing DHS’ responsibilities in regards to anti-terrorism measures for chemical plants. In short, CISA will be held accountable for protecting the nation’s critical infrastructure from physical and cyber threats. (CISA) elevates the mission of the former Department of Homeland Security (DHS) National Protection and Programs Directorate (NPPD) and establishes the Cybersecurity and Infrastructure Security Agency (CISA). CISA is responsible for protecting the Nation’s critical infrastructure from physical and cyber threats, a mission that requires effective coordination and collaboration among a broad spectrum of government and private sector organizations. The DHS’s statement on the matter shows that the new agency will be “working with partners across all levels of government and in the private sector to secure against the evolving risks of tomorrow.”The new agency will have several divisions including a Cybersecurity Division, an Infrastructure Security Division, and an Emergency Communications Division. Christopher Krebs, the current NPPD Undersecretary, will be the first new director of the CISA agency. Today @POTUS signed legislation to stand up the Cybersecurity and Infrastructure Security Agency in @DHSgov. The cybersecurity threat is constantly evolving and this reorganization positions us to better defend America’s infrastructure from digital and physical threats. The reorganization seeks to elevate cybersecurity within the DHS while improving the department’s ability to engage with government and industry stakeholders, Krebs said in a statement this week. “Giving NPPD a name that reflects what it actually does will help better secure the nation’s critical infrastructure and cyber platforms,” Krebs added. Rep. Michael McCaul (R-TX), chairman of the House Committee on Homeland Security, sponsored the bill. “I also want to thank all the hardworking men and women of NPPD for carrying out our important cybersecurity mission each day within DHS. CISA will help bring the recognition this team deserves and will empower the team to more effectively execute its vital mission,” Nielsen said. As a fun fact, in April this year the DHS announced it would monitor hundreds of thousands of news sources around the globe and compile an extensive database on journalists, editors, foreign correspondents, and bloggers to identify top “media influencers” who mention its name. So with that said, this reporter who is a “tin foil hat wearing, black helicopter conspiracy theorist” and probably a terrorist for worrying about increased government surveillance according to DHS press secretary Tyler Q. Houlton, is ready for his close-up. Historically, it has been the FBI who keeps files on journalists and dissidents, not the DHS. The FBI has had files on famous journalist such as Michael Hastings, Peter Jennings, and Walter Cronkite. that are authorized to spy under the guise of protection. Although, many may find themselves asking what purpose does the NSA and CIA now serve? Aaron Kesel writes for Activist Post. Support us at Patreon. Follow us on Minds, Steemit, SoMee, BitChute, Facebook and Twitter. Ready for solutions? Subscribe to our premium newsletter Counter Markets. The Swiss filmmaker Matthias Hancke worked on his first documentary OVERCAST for almost seven years. In 2007 he realized for the first time, that the man-made cloud cover was not a natural byproduct from aviation. Therefore, he started his investigation with the intention to finally prove the ongoing geoengineering program in order to stop this crime. Matthias conducted over 40 interviews in 10 different countries and spent thousands of hours on research and investigation to find out more about the aerosol spraying and why our public officials are not investigating it. OVERCAST incorporated both sides of the controversy, the debunkers and established scientists as well as the activists. The film brilliantly shows how the debunkers debunk themselves with their limited argumentation and lack of scientific data. The other two flights are building the red line of the film. 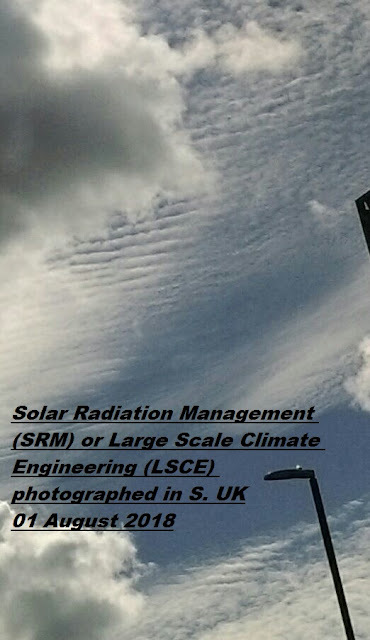 After the film was almost completed, a very rare study from the Swiss Federal Institute of Technology came out with some groundbreaking results; unregulated metals of aluminum and barium were found in the jet fuel, as described in many geoengineering patents (e.g. Welsbach, Huko). OVERCAST is a movie that every activist should watch in order to get the best arguments. Show it to your skeptical and unaware friends to wake them up. It is a film that gives the whole issue and movement the credibility needed in order to stop this crime. OVERCAST has already been shown in over 12 film festivals worldwide. WHY DIDN’T IT RAIN IN CALIFORNIA? 11-14-2018; Giant Front Yields ZERO Rain In CA; Satellite Transmitter Set to Block Next System! ALERT: PROOF THE U.N. IS INVOLVED IN CALIFORNIA FIRES [VIDEO] + WHY IS THE US GOVERNMENT TORCHING THEIR OWN CITIZENS IN CALIFORNIA [+ others] VIA BEAM PULSE DEW WEAPONRY? by M.W.Mandeville earthchanges-bulletin + Why didn't it rain in California? YES! RUSH MY FREE COPY OF WIRE TAPPED AMERICA BEFORE THEY'RE ALL GONE!! Just got my copy of "Wire Tapped America". I have to tell you how impressed I am! We all know the Government is watching us, but I never knew how to stop them, or how simple it could be until I read your book. Thanks, and GOD Bless America. Re: Your Free Copy Of "Wire Tapped America"
The right to personal privacy is one of the most basic right held by all American citizens, and yet that right is being systematically destroyed by the very people sworn to protect it. As any person of average intelligence can see, the Founding Fathers laid out specific protections for your privacy. And that protection must include ALL aspects of your life; from the conversations you have and letters you write to phone calls, text messages and emails. Technically speaking, the CIA is a service that is devoted to foreign intelligence and foreign actions. The CIA is vehement in official communication that it exists to gather intelligence and perform operations outside the United States, however, there is no way for you, the average American, to really know the extent of what they are up to. Whatever your thoughts are about Wikileaks – the global organization devoted to the gathering and publishing of classified information stolen from world governments, they have recently dealt the CIA a serious blow by releasing a huge cache of classified information about the way CIA hackers are able to penetrate and monitor computers, cell phones, televisions, and even vehicles. As an American I feel it's my responsibility to show you exactly what the CIA is doing, how they're violating your rights to privacy and how you can stop them from being able to do so. I'm not in any way saying that the CIA is "bad" as a whole, but the American public deserves to know the truth about how our tax dollars are "protecting us." One of the most important rights we hold as Americans is our right to privacy, but that right is being tossed into the trash by the very people sworn to protect it. I’m Frank Mitchell, a proud member of the US Armed Forces. And I’m going to show you exactly how the Government, and especially the CIA is spying on you at this very moment. What the CIA really is. Most people think "Jason Bourne" when you mention the CIA, but in fact the "agency" is really something VERY different, discover the truth on page 11. Wikileaks - the good, the bad and the ugly. The Wikileaks organization has been vilified by the US government, but is what they're doing good or bad? You'll discover on page 12. How your own TV may be spying on you, yes your TV. You'll learn how this is accomplished as well as how to stop this heinous invasion of your personal privacy. On page 15 you'll discover the disturbing truth about your smart phone. Did you know it can be hijacked to watch everything you're doing every minute of the day? This and many other serious weaknesses will be uncovered so you can protect yourself. What about your computer? The CIA hires genius programmers right out of college and molds them to their will. On page 23 you'll see just how far this rabbit hole goes, trust me, it's scary.